While the billboards that visualize the ambitious horizon of a future Dubai aim to convey faith in boundless economic growth and technological might, they thus actually take their inspiration from a cinematic imagination that already harbours the nightmare of collapse. Using visual references such as the code of the Matrix – which in the 1999 film signified an illusory dream world conjured up by an inhumane system – to promote a property project, seems paradoxical at least. With the same conviction as the real estate public relations machine, the blockbuster taglines announce reverse scenarios: ‘The future could be history’, ‘The biggest disaster in history is about to arrive’, ‘Plan Your Escape’. 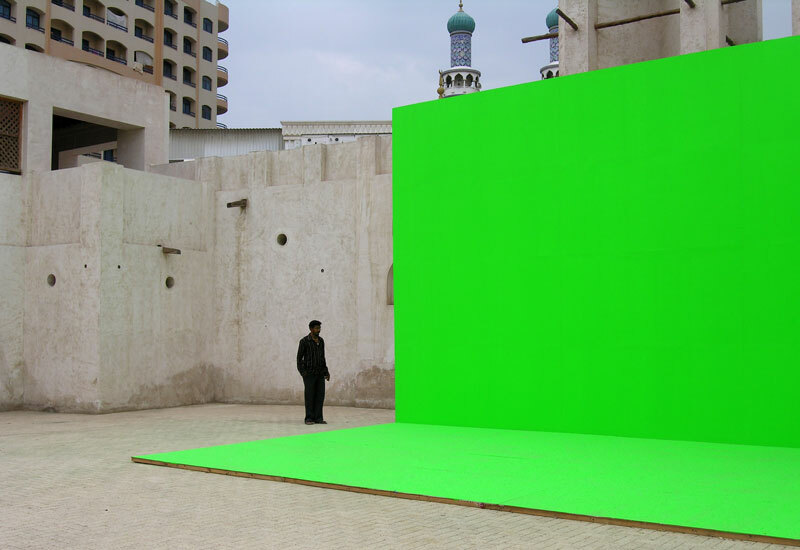 Wandering through the Future consisted of a stage, which combined the cinematic imagination of real estate billboards with the image of a green oasis. 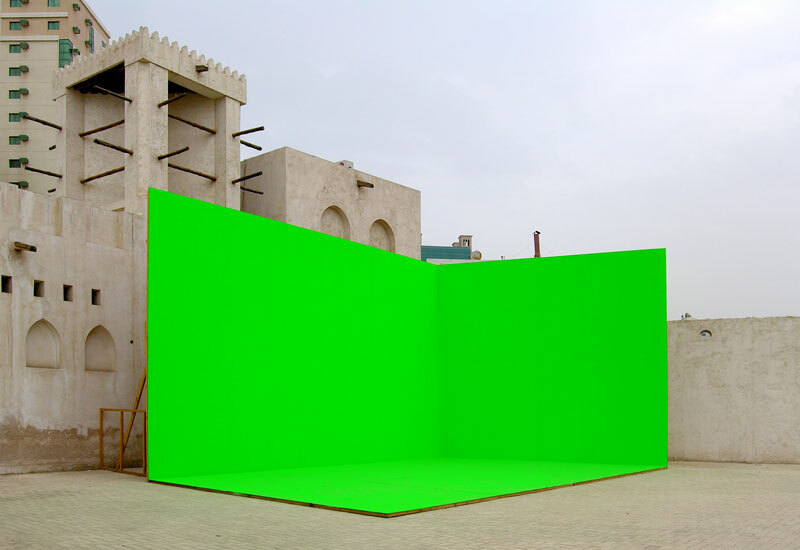 A structure that mimicked the way the billboards form a wooden screen onto which virtual impressions of an ideal city can be projected, was painted in chroma key green – a colour used in cinema for backdrops that allow actual people to be edited into augmented or virtual realities. 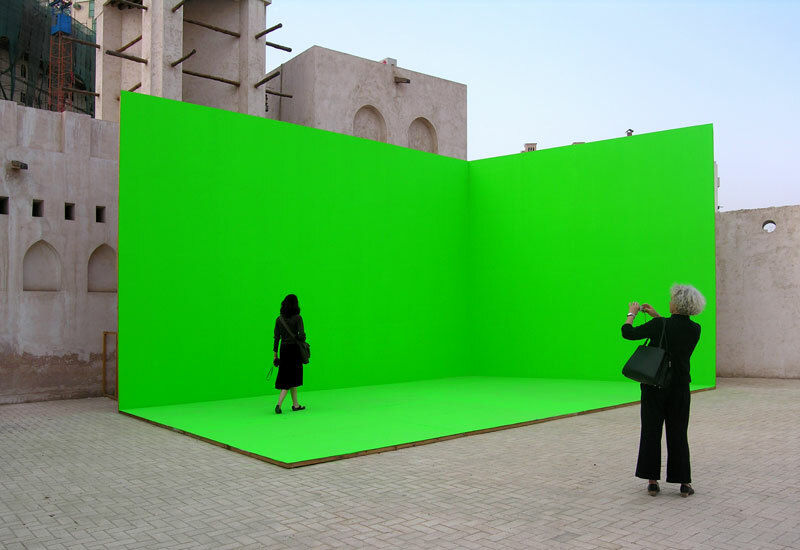 Passersby were invited to step into this bright green space, and imagine their own ideal scenarios. 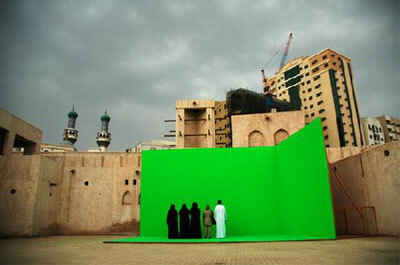 The stage was placed in the courtyard of the Sharjah Heritage Museum, located in the architectonic heritage area of the city, where life size models invite visitors – mainly tourists – to imagine an idealized past.